These Finns have an unusual band name, which is pronounced “zero exist,” and they say it’s “a state in which nothing and all exists.” Their band is doom metal, but they prefer “dark metal,” which is cool, because it’s certainly that. The shortest song is about five minutes. There’s some Morbid Angel in the music, although not in the fast, technical way, and they cite bands like Tryptykon as influences. But there’s plenty of dour atmosphere, and some clean guitar and melodic vocals in places that adds to it, but usually there’s grit in the voice and distortion on the guitars. They write some killer doom riffs, and nice double-guitar parts. The production works well. But one of the great things about this record is there’s no American-style groove or stoner elements. 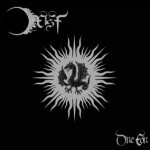 One Eon is available on CD, vinyl and digital download from Death Shrine Offerings, and it’s well recommended! This entry was posted in Reviews and tagged 0xíst, doom, Finland by Editor. Bookmark the permalink.